Crawford: I'm The Best Boxer in The World - Hands Down! 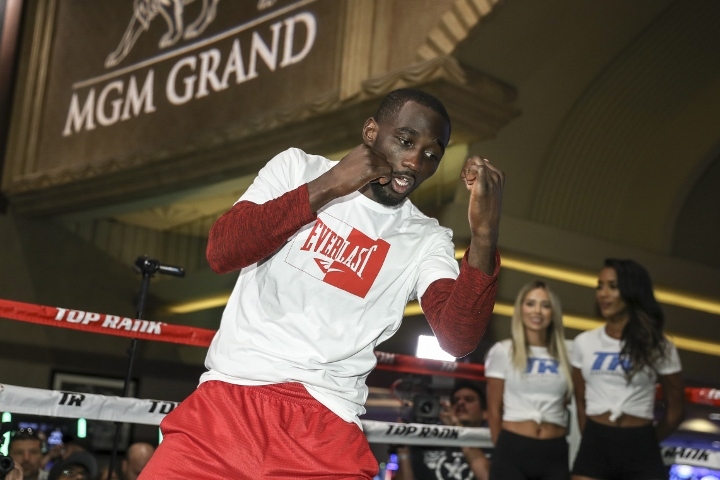 WBO welterweight champion Terence Crawford firmly believes that he's the best pound-for-pound boxer in the world, in the wake of Vasiliy Lomachenko's bruising performance on Friday. There is a growing debate regarding the top pound-for-pound spot in boxing - with many experts tabbing either Lomachenko or Crawford in the top spot. Both Crawford and Lomachenko are three division champions. Lomachenko dominated and brutally knocked out mandatory challenger Anthony Crolla in four rounds at Staples Center in Los Angeles, California. But Crawford disagrees with anyone who believes another boxer is above him. Crawford explains why he strongly believes that he's got a deep grasp on the top spot. "I am the best boxer in the world - hands down. I can box at range or fight close up, whatever's needed. I can box equally as well on the back foot or the front foot and I have very good sideways movement. I'm a southpaw who is just as comfortable when switching to orthodox," Crawford told Daily Mail. "I have hand speed as well as punching power and I am excellent defensively I'm an intelligent fighter who adapts to any opponent. I believe I am the complete boxer so, yes, I think I'm the No 1 pound-for-pound." This coming Saturday night, at Madison Square Garden in New York City, Crawford will defend his title against British superstar Amir Khan. Crawford is a huge favorite, and there are many who will evaluate his performance against the recent victory by Lomachenko. "'I am not taking him lightly. He is a very good boxer who I rate as one of the best in the welterweight division. He is very fast, knows what he is doing in the ring and has not lost at welterweight. We have taken every precaution in our preparations. We will bring all that down a little now. Become more focused in order to prepare mentally for the fight. Another psychological adjustment will come on Saturday morning," Crawford said. [QUOTE=MDPopescu;19662038]Lions Den Boxing Community?... :)[/QUOTE] Yeah, that is the most unbiased pack around boxing, smart educated cats. You should know them. Not racist at all since they have a pass, and a free cheeseburger with it.